Interest in Klopp's return to Dortmund was huge in the build-up. The 48-year-old German is fondly remembered for his achievements at the club he managed for seven years from 2008, having led them to two Bundesliga titles as well the final of the Champions League in 2013. Around 20 television crews and some 100 journalists were in attendance for his pre-match news conference, while one German TV had been planning a 'Klopp Cam', which would have focused on the Liverpool boss for the full 90 minutes - although that idea was ultimately shelved. When Klopp emerged before the match, his name was chanted by the home fans but the Liverpool boss was evidently keen to make sure he was not the centre of attention. After acknowledging the home fans with a clap, he switched focus firmly to his own players warming up and there was no doubt about where his allegiances lie when he thumped his chest and roared in delight after Origi's goal. Despite the away goal, the tie is far from over. Dortmund have scored in each of their previous six away games, including two goals at Tottenham in the previous round of the competition. Improving their defending at set-pieces will also be key for Liverpool. Hummels was left unmarked to head in the simplest of goals from a corner, meaning the past three goals Liverpool have conceded in the Europa League have been from set-pieces. History is on Liverpool's side, though. They have progressed from 11 of their past 12 European ties in which they have drawn the first leg away from home. Borussia Dortmund manager Thomas Tuchel: "In a quarter-final it can be that you don't deserve to win and that was the case. "We are able to score away goals as well. We are not frightened and we are not too disappointed. Tonight was not our top performance and to win you need a top performance. Liverpool manager Jurgen Klopp: "Dortmund is a pretty good side and everyone could see that, but we had our moments and we could have won the game. "I'm pretty sure a lot of people thought we would lose 2-0, 3-0 or 4-0. But at some moments we had Dortmund and around our goal we were brilliant. "We are not that far on our way to being like they are. We cannot at the moment play like they play, but we can defend and score goals so we can win." On his own reception from the Dortmund fans: "It was nice. A lot of people spoke about it but when I came onto the pitch it was respectful applause and that's nice. That's how it should be." Divock Origi scored his first Europa League goal for Liverpool and his first since October 2014 for Lille against Wolfsburg. Origi is the ninth different Liverpool player to score in the Europa League this season, with only Lazio and Napoli (10) having more different scorers. Five of Origi's six Liverpool goals have been scored away from home. Mats Hummels scored Borussia Dortmund's fifth goal from a corner in the Europa League, more than any other side in the competition. Dortmund have been eliminated on five of the six occasions they've drawn the first leg of a European tie at home. Liverpool host Stoke in the Premier League on Sunday, while Dortmund travel to Schalke in the Bundesliga on the same day. The two sides then meet at Anfield in the Europa League quarter-final second leg on Thursday, 14 April. Match ends, Borussia Dortmund 1, Liverpool 1. 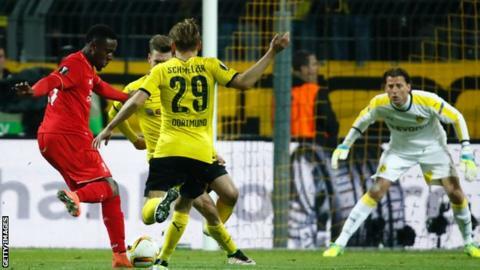 Second Half ends, Borussia Dortmund 1, Liverpool 1. Nuri Sahin (Borussia Dortmund) wins a free kick on the left wing. Offside, Liverpool. Simon Mignolet tries a through ball, but Daniel Sturridge is caught offside. Substitution, Liverpool. Daniel Sturridge replaces Divock Origi. Dangerous play by Divock Origi (Liverpool). Sokratis (Borussia Dortmund) is shown the yellow card for a bad foul. Substitution, Borussia Dortmund. Christian Pulisic replaces Pierre-Emerick Aubameyang. Substitution, Borussia Dortmund. Sokratis replaces Sven Bender. Dangerous play by Adam Lallana (Liverpool). Offside, Liverpool. Philippe Coutinho tries a through ball, but Divock Origi is caught offside. Attempt blocked. Nathaniel Clyne (Liverpool) right footed shot from the right side of the box is blocked. Assisted by Adam Lallana. Offside, Liverpool. Simon Mignolet tries a through ball, but Divock Origi is caught offside. Offside, Borussia Dortmund. Roman Weidenfeller tries a through ball, but Pierre-Emerick Aubameyang is caught offside. Attempt saved. Marco Reus (Borussia Dortmund) right footed shot from outside the box is saved in the centre of the goal. Attempt saved. Nuri Sahin (Borussia Dortmund) left footed shot from outside the box is saved in the bottom right corner. Assisted by Julian Weigl. Offside, Liverpool. Nathaniel Clyne tries a through ball, but Adam Lallana is caught offside.